Of course the research for my ‘roots’ will never be completed, but very much expansion of the family tree is not expected at this moment. Currently we have contact with people over the Internet that in some way are interested in the research for the family Waterlander and its origin. At the bottom of this page some people are mentioned with who we came in contact, mentioning them all is unfortunately not possible. I have created a family tree version, showing the descendants of family Waterlander (staring approx 1600). There is also a name index for the descendants available where you can lookup names and jump to the decedents page for a specific person. Meanwhile we have been able to add pictures to the genealogy site. This increases the time the page loads, due to the pictures on the pages. If you are a Waterlander and your picture is not (yet) on our site, ore you would like another picture of yourself, than you can send a picture to us by e-mail. Please keep in mind that loading the complete pedigree can take a bit longer. While loading you can already see the start of the family, but more recent parts require some time to finish loading. I would like to expand our family tree, both in ‘with’ as in ‘depth’, so any information is always welcome. Our e-mail address for info is: website@waterlander.nl. In the beginning we made a version based on data we had ourselves. Thanks to the data that was put at our disposal by Hiltje Woudstra-Waterlander it became very huge. Her farther had already started some research in the passed (approx 1975). These overviews where then checked with the data from Genlias (a Dutch initiative to open all archives) and the Friesland (regional) archives. In addition we received a nearly countless amount of positive reactions on our overviews with additions or improvements. Until now we came in touch with over 80 persons regarding the genealogy Waterlander and their improvements/additions to it. Based on theses sources we have been able to go back to approximately the year 1600 for our family. The research directly made clear where there family originally came from. 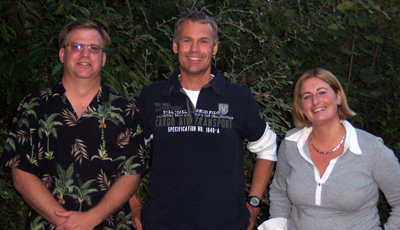 It is clear that the family originates from the local province “Friesland” for some time. Within this province, the original region where our family has its origin, is the region “Haskerland /Aengwirden”. By clicking on the maps below, you can get an impression of how the regions must have been in that time. By studying the data it becomes clear that people are more mobile nowadays. As of 1900 people become spread outside the province Friesland, up to America. Furthermore we have started a research for the origin of the name Waterlander. On separate page you can find the current outcome of this research. During the research we encountered some remarkable aspects. Very special for us was the discovery of the birth of a son, while the husband with who this woman was married already deceased. The father of this bay was unknown, with as consequence gave the same last name as his mother (Waterlander). Would this not have happened, than the family tree Waterlander would have been much smaller. Furthermore we noticed that a number of times children were born, although the farther and mother where not (yet) married. Sometimes this marriage was performed later on. 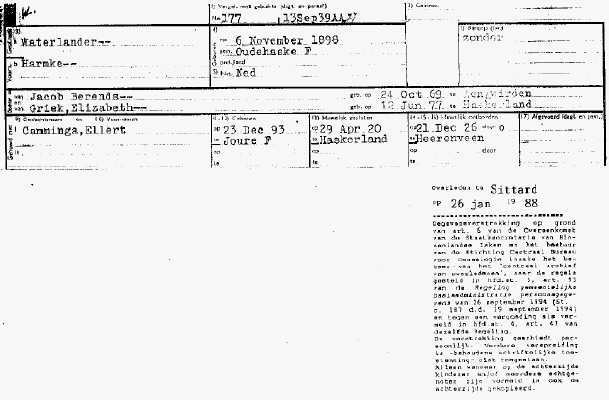 Finally a family came to our attention that started to whirl around the Netherlands in the time period 1900 – 1930. Besides the number of different places this family ended up, it was even more remarkable that they divorced already in 1929. In addition to this a daughter of this couple also divorced (sea certificate below). Tresoar Fries historical and literary centre (the former Ryksargyf Friesland). Site is in Dutch! Website of Jehannes van Haskera regarding research of Hasker families. Site is in Dutch! Genealogie in Friesland a website of Andrys Stienstra. Site is in Dutch!